Yes E-license only this year. You can register at home and then take your angler number to a shop to purchase your license. This way you do not need to use your credit card.E Licenses will be available for sale starting March 20th. I would suggest you do not wait to long as I am sure the site will crash when heavy traffic occure just like it did last August. I emailed them a cheque and it got rejected . Don't have credit cards, never applied for one much rather pay cash. Maybe i will just scan some bills and send them away. you can get your new 2009-10 license now. They became available on March 1 this year. I got mine on March 2 so why wait and maybe incurr site problems? so wat happens to the dude who can only pay cash!!!!!!! Thats a load! Just makes it more complicated and time consuming. so wat happens to the dude who can only pay cash!!!!!!! That's what I said a year ago. They should set up Interac payment like they do on other sites. That way you'd have an option if you don't have a credit card. A teen cannot get a credit card until they are 19, but they need to have a license when they are 16. Silly! Tanks guys for your answers! I got exactly that problem as I don't own a credit card... Think I'll go to the tackle store (searun) around the corner next week and see what they can do. Maybe they can order it for me and I pay cash for it, we'll see. !. Where is all this money that is being saved going to be used. licence and that person is starting off again with a clean licence. While discussions of the pros and cons of this new system are good on the forum, you should also express the same concerns to those who are managing the system so they are aware of them. These discussions will eventually sink into the archive and the message will not be heard if not delivered. As Steelhead King has pointed out, the conventional license purchasing method (visiting a tacklestore, pay by cash, debit or credit card) will still be available. The difference will be that the staff will be filling it out on the computer instead of hand-writing it. In the next few weeks, more information will be available on which and when tackle stores will have this service available. Stay tuned. Nick, the new version of the freshwater regulation synopsis will be on the same ministry webpage. When the new license year begins (April 1st, 2009), the PDF files will be updated to the files from 2009-2011 version. Think the savest way would be to enter your fish in the license and within 24 hours into your "account " so you can't print a new one without having it on your license or at least enterd at the "Headquarter". That's an interesting suggestion Nick. Right now beside recording the catches of steelhead and chinook salmon on your license, there are no such requirements, probably because it simply isn't enforceable. Recording by handwriting is only semi-enforceable. The only opportunity for an conservation officer to charge an angler for violations in this category would be on the day of the event, ie. 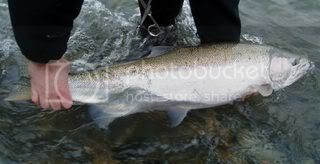 the presence of the steelhead or chinook salmon that the angler has killed and the absence of recording on the back of the license. If the angler is not caught when the fish is not recorded on the license, he or she would have the opportunity to exceed his or her annual quota. This was already possible with the conventional hand-written issued license, but the online licensing just made it easier. Even for anglers who intend to obey the law, if fish have been recorded on the license but it was lost unintentionally, then those recordings would be impossible to retrieve unless they have been copied onto somewhere else for future reference. This is where your idea of recording online once returning to home, but it would entirely be controlled by self-policing, because it is not enforceable. Just a couple of notes regarding frequency of violations. Twice per year, we (representatives of the Fraser Valley Sportfishing Advisory Committee) are briefed by the Chilliwack DFO C&P detatchment on their observations in anglers' behaviours etc. Overall, anglers are generally very good at complying. With a few exceptions, most common violations are fishing without a license, barbed hook, retaining fish illegally. The common perception among seasoned anglers, especially on the online forums, is that incompliance is sharply rising based on personal observations and readings of other anglers' experiences. The problem with such method is that it does not paint the whole picture because we (not just anglers, just in general) have a tendency to be outspoken when negative experiences occur, while positive experiences are neglected as they often do not make an exciting story. This is very evident when one browses through today's news media. Statistics measures more accurately (not 100% accurately) when determining the trend of incompliance. Majority of the observed violations are committed by entry-level anglers (violators who are well aware of their action would not be conspicuous for obvious reasons). To combat this problem, seasoned anglers should assist, not confront, them to ensure future violations would not be made. Appropriate approaches are needed if one wishes to protect the resource. The alternative would be to ignore or confront, which does nothing except to promote the growth of incompliance, because there will always be new anglers who are not fully informed when starting out. We seem to be unable to find a good balance between access and protection of our resource. On one hand, we are proud and glad to have full public access to all fishing waters. On the other hand, we somehow expect all anglers to be at the same level and become intolerant to newcomers when they have simply found the same access and enjoy utilizing it as much as others do. Nick would be aware of this, as he and I (and many others on the forum) have fished in Europe where freshwater fishery resource is often micro-managed privately. Stream banks are owned by farms. Local fishery society purchases access rights to a length of stream bank (measured in metres, not kilometres). Non-society members pay a day-user fee if they wish to fish it. The fee is then used to fund this access. Society members have the privelege to use this access indefinitely, but they pay a large sum of annual membership fee. Members also have the interest to protect this resource, so they log in their rod hours and catches. These data are collected in the end of the year, which can determine angling effort and stock status. Such management is expensive for users, but it raises the quality of the fishery, which I personally find quite enjoyable. Whenever I have had a chance to fish streams that are managed in this way, I find myself fishing alone on garbage-free river banks. Perhaps this is the type of management that existing BC anglers are longing for? Perhaps this will be the future of BC's fishery management when population growth reaches an intolerable level. While it is true that the resource should be managed soundly by the government, resource users have a large influence on the future of our recreational fisheries. Like any other new systems, the online freshwater fishing licensing system is at its juvenile stage so glitches will occur. You can be part of the solution to these glitches by actively consult with those who run the system, as they cannot make changes unless there are feedbacks. Did you change the Header/Name of this topic, Rod? I changed the title when I merged two threads on this topic together this morning. I took your advice and I sent a copy of my post on Email licence`s to the Email address that you provided along with my own Email address if a person wanted to reply. I also agree that any rules are only a aid to make the honest anglers aware of the rules. The people that choose to break the rules will in some form always be there. We as humans all know that. But this is my 2 cents worth-some my like it some may not!